Some things in life are not for everyone, yet these rarities tend to draw curiosity while they remain to have a niche group of dedicated followers that demand these quaint tastes of life. One particular taste of life that seems to be a treasured rarity is the Toyota Land Cruiser and its Lexus LX 570 brethren. The latest iteration of the largest SUV from Lexus, the 2014 Lexus LX 570, happens to sit in its proud corner reserved for those who know exactly what they want in a large body-on-frame, luxury-appointed SUV with seating for 8. The 2014 Lexus LX 570 brings the essence of what a large SUV used to do in making a statement of its massive presence on the road. That traditional spirit has faded away in many automotive brands but remains going strong in the Lexus LX 570 and its Land Cruiser sibling. Powered by the familiar 5.7-liter V8 engine producing a healthy 383 horsepower at 5,600 rpm and 403 ft-lbs. of torque at 3,600 rpm, it remains to be plenty of grunt for a large SUV. 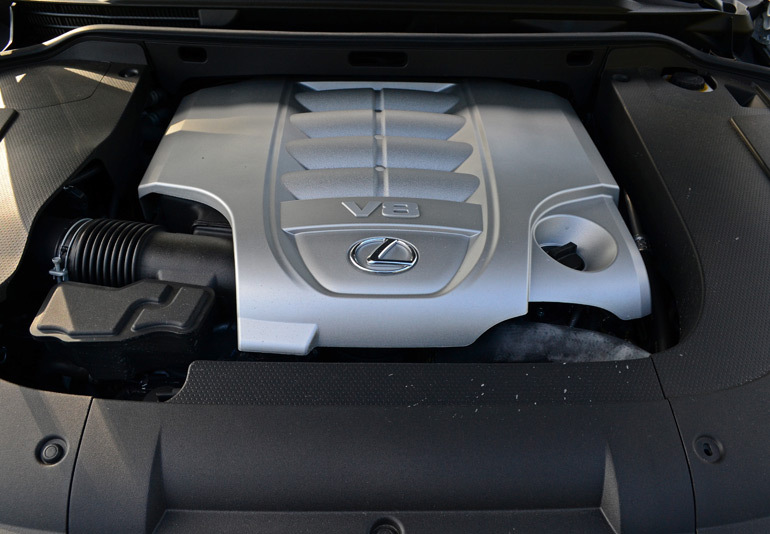 However, considering the curb weight of the LX 570 opening your eyes wide to the tune of 6,000 pounds, the adequate V8 engine doesn’t seem so thrilling anymore. I have to say, the LX 570 is no slouch even with its massive curb weight, but it does slip a bit behind some of its competition when it comes to shear athleticism on the road. Still, you can expect the LX 570 to get out of its own way with some authority and minimal fussiness about making it to 60 mph in about 7.3 seconds. 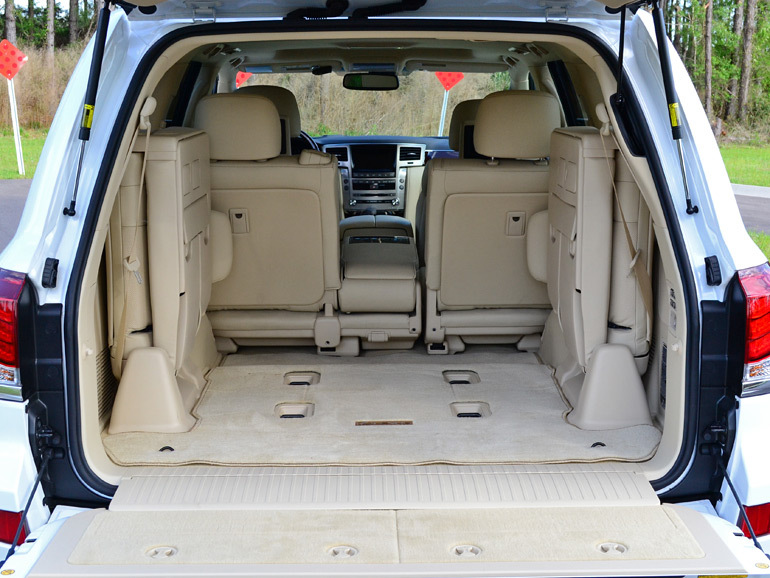 The mammoth-like Lexus LX 570 is almost in a world of its own, a place that isn’t too shabby to spend a few hours behind the wheel or in the lap of luxury in one of the other 7 available passenger seats. The Lexus LX 570 combines a rarity among large SUVs today, rugged construction and superb build quality wrapped up in a luxurious package. There is no doubt that consumers of the Lexus LX 570 have a ‘size matters’ personality as it just makes a bold statement of rolling 6,000 pounds of Lexus-laced-luxury-SUV down the road. The 2014 Lexus LX 570 takes up its luxury side and ruggedness to give you the ability to perform off-road duties without much fuss. The advanced suspension system, combining adaptive dampers with 3 ride modes and a full air suspension system with auto-leveling and an easy exit-lowering system placed in a package assured to be reliable. The air suspension system not only gives you confidence of navigating through questionable off-balanced terrain and even snow, but it serves as a means of easy access through enabling the auto easy-entry and exit feature, automatically lowering the vehicle about 2 additional inches to its lowest setting after turning off the ignition. 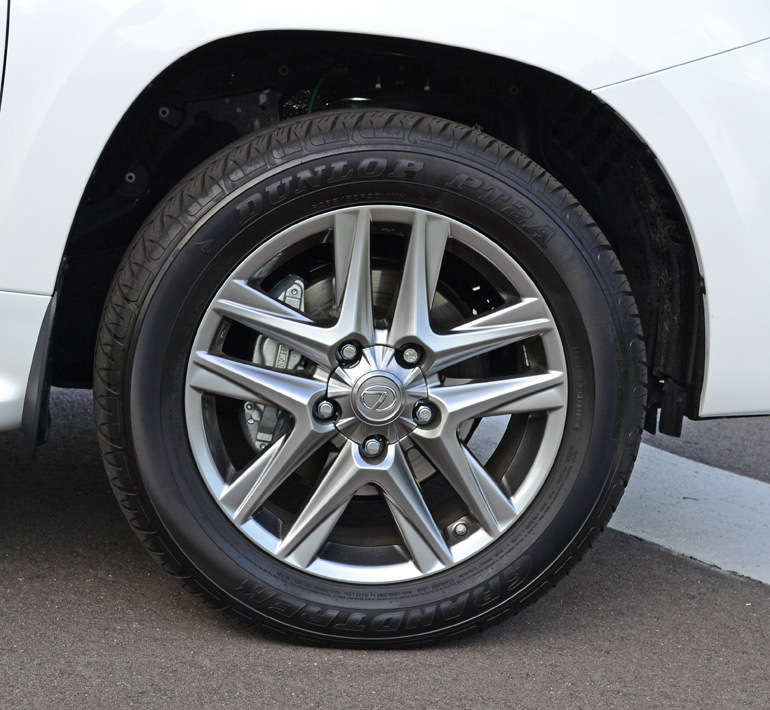 Additionally, the air suspension adapts to keep the LX 570 level dependent on loads. 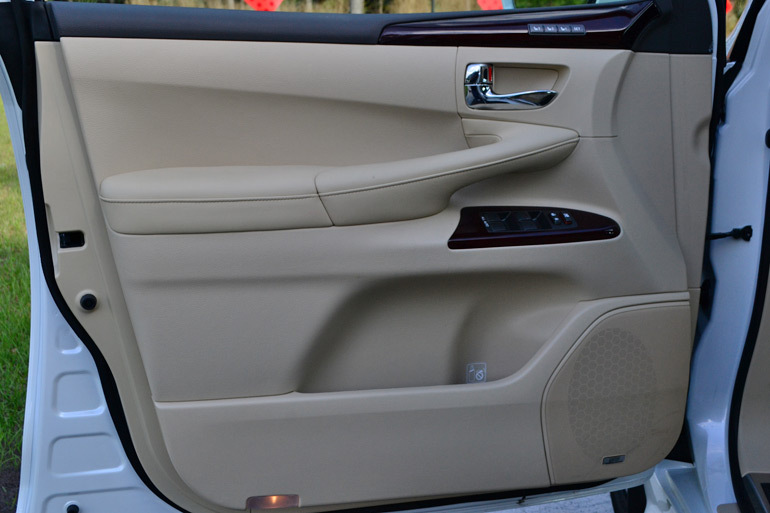 In all, the system works seamlessly and proves to fill the value perception of a vehicle for those who live in excess. 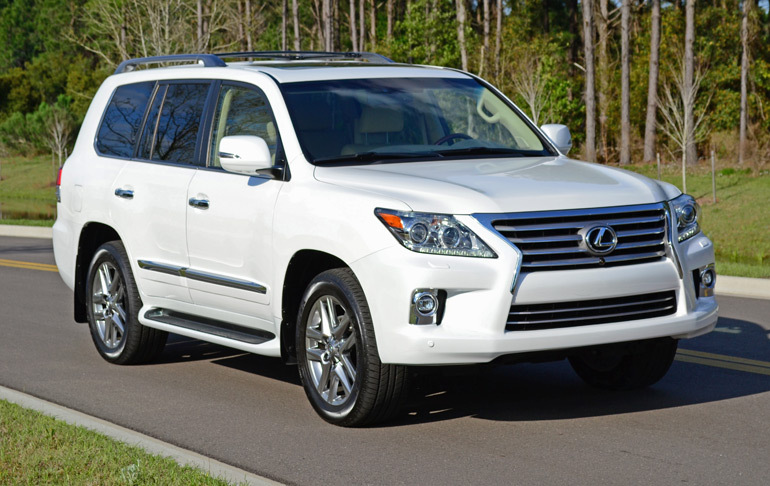 Speaking of excess, the 2014 Lexus LX 570 is a thirsty vehicle, and there really is no way around it even if you practice hypermilling as a religion. The 5.7-liter V8 with its 24.6 gallon tank full of premium unleaded fuel is quickly depleted, as you will expect to get about 16 mpg at best with a full load of 8 passengers on the highway. The EPA estimated 12 mpg city and 17 mpg highway is mostly dead-on for what you will get in the real world situations without a full load. I was able to muster out at best 20.6 mpg on the highway around a constant 65 mph all on a level surface and toting around 2 additional passengers. That figure quickly diminished to about 17.1 mpg when approaching 70 mph. Anything over 70 mph you may want to program the nearest gas station into the navigation system or you could expect to reach your range limit in under 300 miles. Moreover, around town don’t be too shocked to hit mpg figures as low as 10.5 mpg, which I saw in constant stop-and-go traffic. 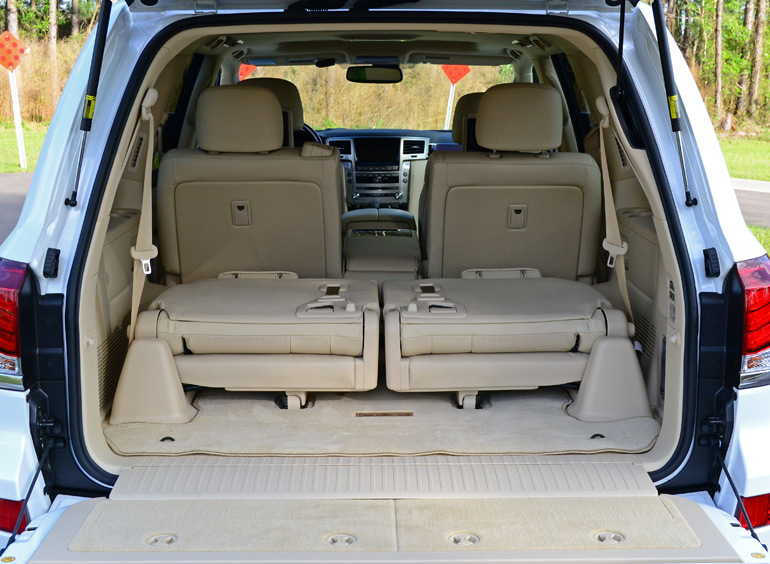 Ultimately, if you lay down close to $90K on this plush mammoth SUV, you’re not too concerned about fuel consumption. That’s why Lexus also offers gas-sipping hybrids, a little something for everyone. 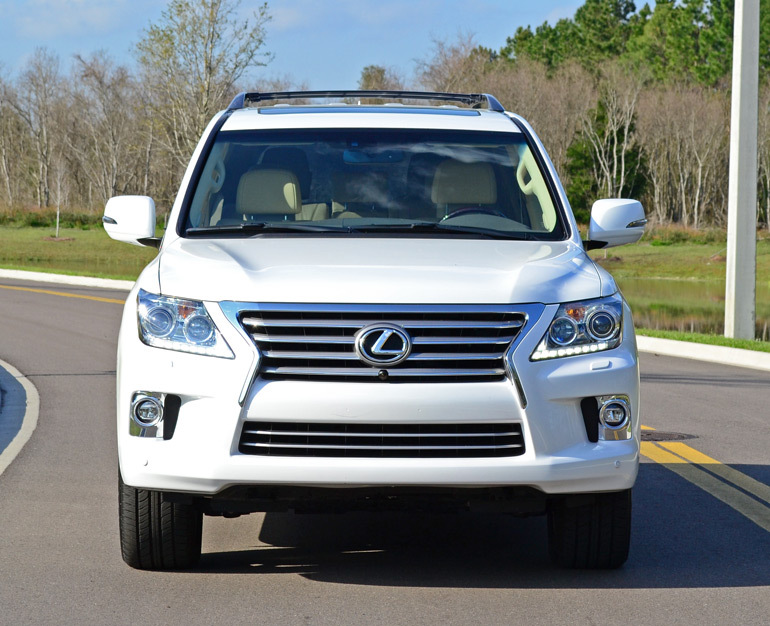 As far as the driving mood of the 2014 Lexus LX 570, it doesn’t drive anything like a car but it is not all that bad. In terms of the ease of maneuverability, the LX 570 is surprisingly easy to roll through narrow roads or even twisty roads but it does tax your nerves as body lean and its shear size comes into play. 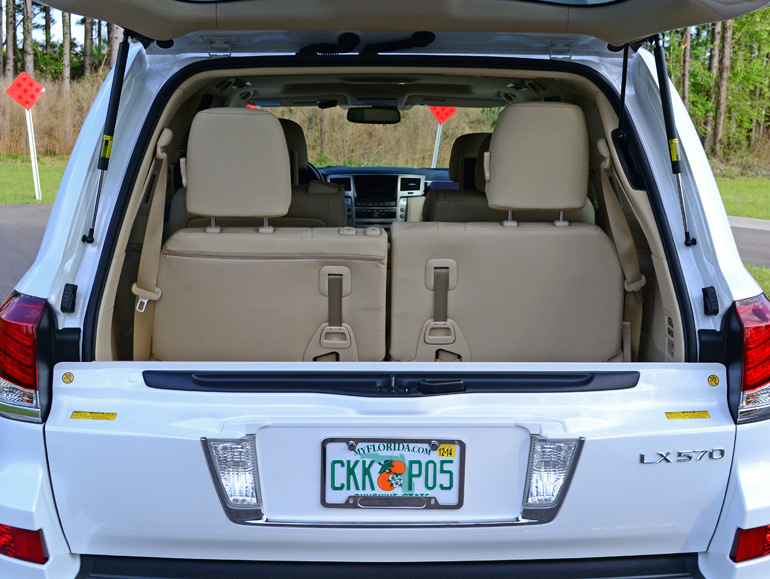 Putting the LX 570 into gradual turns can leave you quickly at the mercy of stability control combined with pulsating of the ABS as it attempts to sort out the 6,000+ pounds of potential trouble. Reaching that limit should never be on your to-do list as it may end very badly but not without a fight. If things to terribly wrong you always have the reassurance of safety with the LX 570 having a total of 10 airbags and a relatively fast-acting stability control system. Performance of the LX 570 can be a tad sloppy at times, but it is never so disordered to the point of unsetting your attempt to point it in the right direction and it reacting properly. The adaptive dampers and air suspension all aid to keep things stable. The three suspension modes, sport, normal and comfort, all have a subtle character. 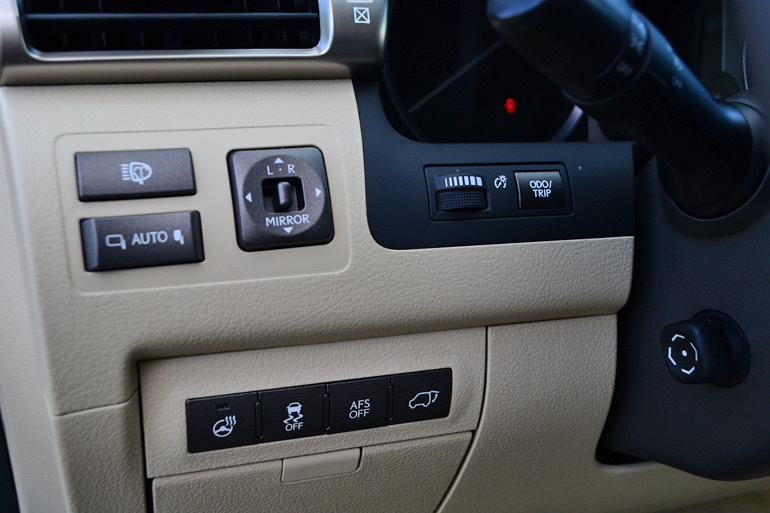 I can say Sport mode is the more desirable choice as it does not diminish ride quality but adds an extra bit of dampening to keep the LX 570 on a more stable ground eliminating the extra bit of body lean and roll. Basically, Sport mode is the best of both worlds as it prevents unwanted body motion but retains the supple and smooth ride of the LX 570. The braking of the LX 570 is assuring by way of a highly boosted system. The brakes, with 4-piston calipers biting down on large rotors up front, have an extra boost of assist making pedal effort easy but not to the point of being overly sensitive. Surprisingly, the LX 570 comes to a stop in just 119 feet from 60 mph, which is pretty good for this caliber of an SUV. I had the chance to take the Lexus LX 570 off road for a couple of miles and it proved to be quite the capable large body-on-frame SUV. Some of its off-road prowess on small inclines reminds you of the older Toyota Land Cruisers dating back to the 60 Series in the 1980s, having that unshaken ability to go where you point it no matter the type of road condition – only the LX 570 never really assured me of taking it over or down extremely steep inclines or grades, just because I would hate push around the mass of such a vehicle even with the assistance of its advanced Crawl Control system, which modulates the brake and throttle to maintain a slow and steady pace on steep declines. 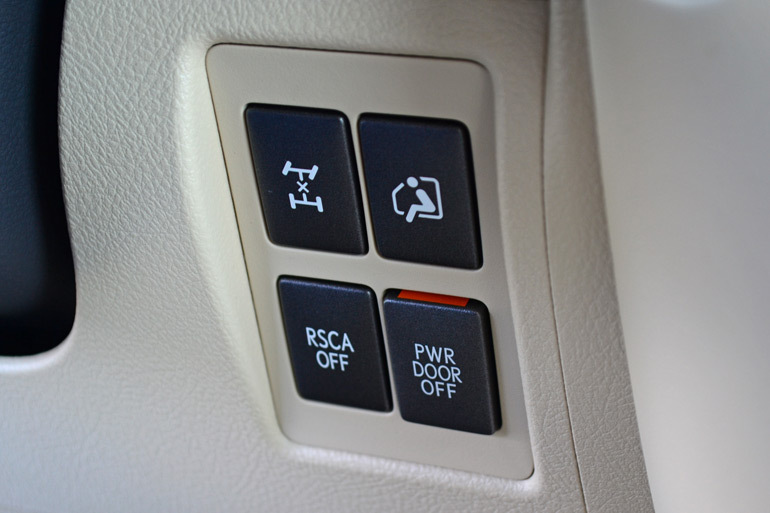 Additionally, there is a front grill-mounted camera and a passenger-side camera activated by a dashboard button or automatically-set when stopped. Of course the added cameras are in addition to the coveted-for-this-size-vehicle-backup camera. The cameras give you a decent perspective for parking in tight spots or navigating rough terrain slowly. 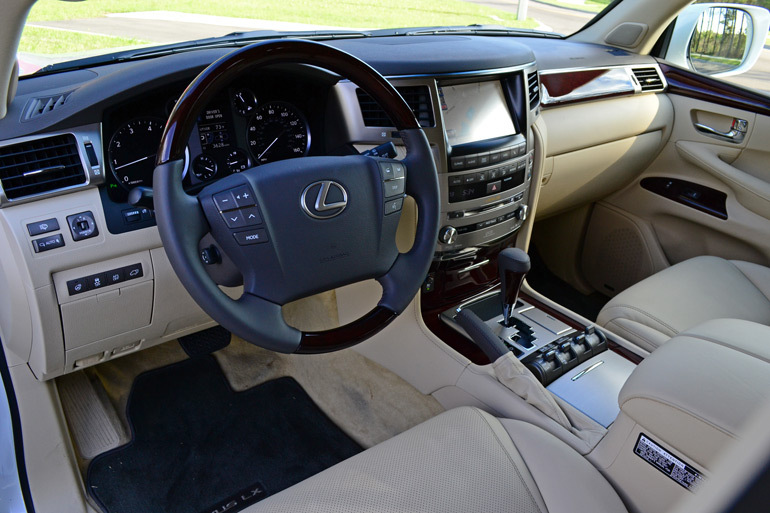 The cabin of the 2014 Lexus LX 570 is much like the interior of any current Lexus, only enlarged. Pick one from the lineup and magnify it and bam, you have the largest and most refined Lexus interior to come out of Japan landing on our shores. 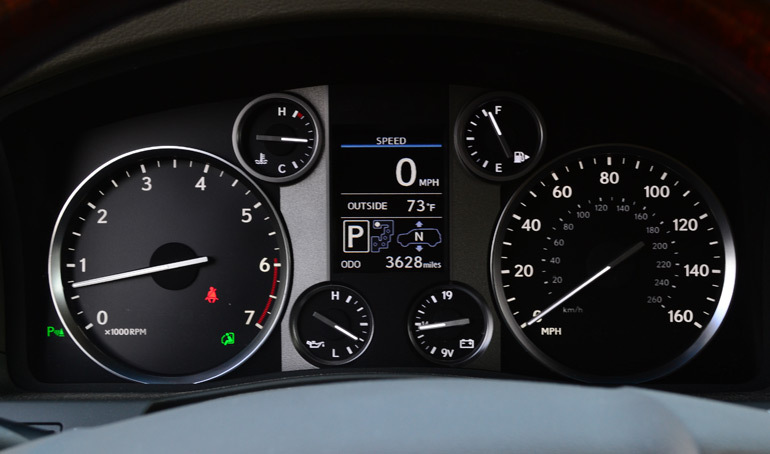 The dashboard may initially appear to be overwhelming with the many function buttons, mostly to turn on or off many unique features, such as adaptive front lighting system (swivels headlights with direction of steering input), easy-exit-entry air suspension, air suspension height adjustment, four-wheel-drive high-low, Crawl Control and decent/ascend operation, suspension damper adjustment (sport, normal, comfort), transmission setting (power, normal or 2nd gear start – you could potentially save a few drops of gas using the 2nd gear start option) and Turn Assist to help tighten the turning radius by braking the inside rear wheel with Crawl Control activated. 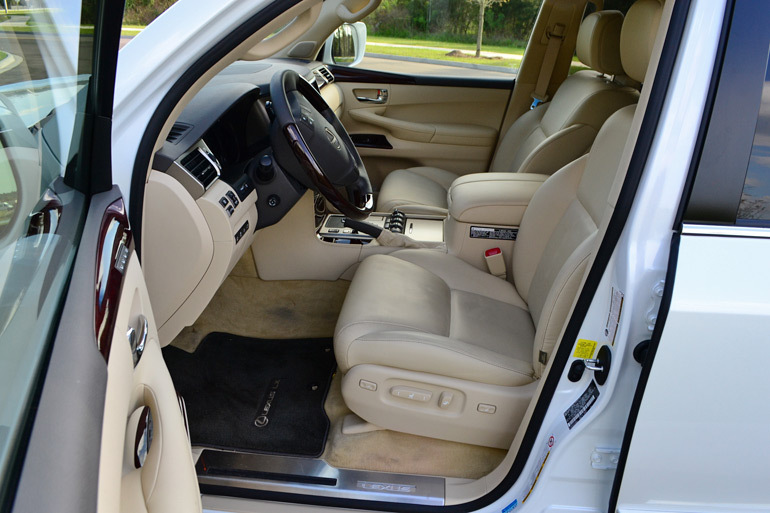 A few other highlighted luxury options equipped on my LX 570 test vehicle included an air conditioned cool box in the front center armrest compartment, 2nd row dual remote controlled LCD entertainment screens fed by the DVD player from the dashboard audio unit, heated 2nd row seats, and a crisp-sounding Mark Levinson audio system. The 2014 Lexus LX 570 is without shortcomings when it comes to a durable and slightly off-road-capable luxury SUV at the upper echelon scale for size of consumer vehicles. The seating conditions for 8 passengers are ideal for 8 adults but the 3rd row does leave some additional legroom to be desired when the 2nd row power sliding seats are adjusted fully aft. Access to the 3rd row is a special act as is the act of power-folding the 3rd row into the left and right side panels instead of in the floor. 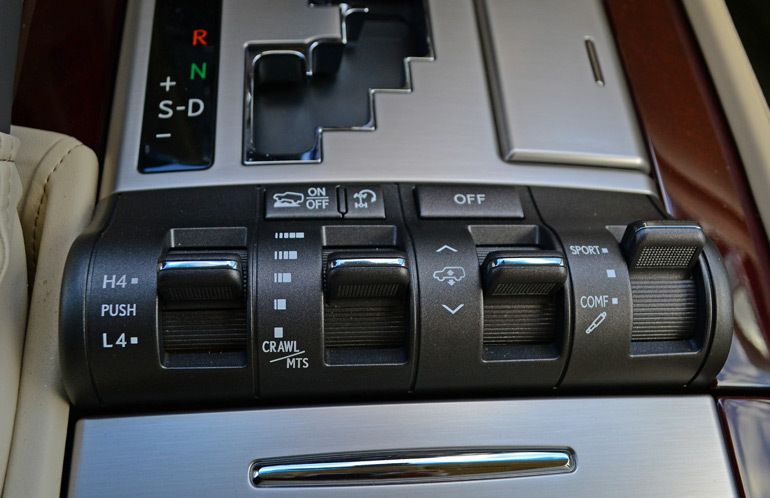 This folding act does limit some cargo space but makes the process easy like watching a transformer perform its act on the Hollywood big screen, at the touch of the remote buttons. 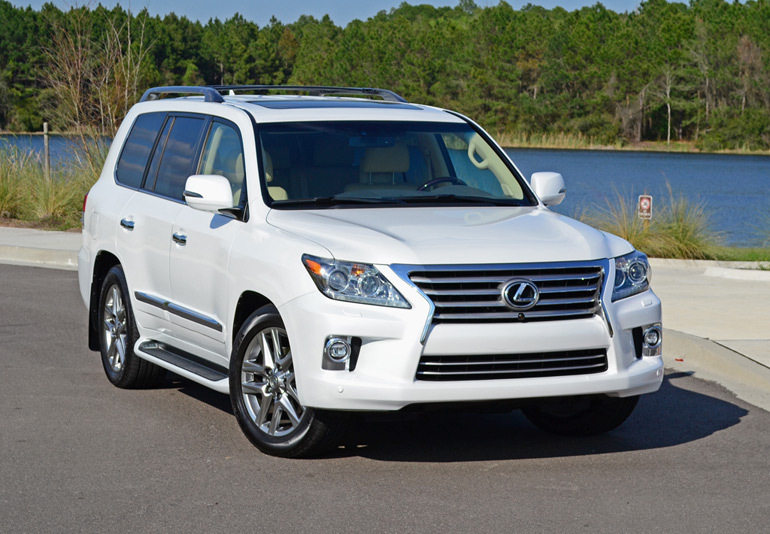 With the 2014 Lexus LX 570 having a niche and specific following of consumers, it is an attribute much to its hefty pricing starting at $81,780. Loaded up with all available options the new LX 570 will reach the as-tested price of my test vehicle at $89,895 including a $910 destination charge. Apart from the eye-popping price, the LX 570 doesn’t disappoint for those who seek an unadulterated life-in-excess-luxury SUV with unsurpassed build quality and a long linage of successfully ‘Land Cruising’ dating back to the 1960’s. As an automotive journalist, I am able to test-drive quite a few cars. Many of the vehicles I review transparently blend into the crowd; rarely eliciting a comment from a friend, much less a stranger. Other cars will draw fans of the brand, an occasional brave soul will approach me in the parking lot or roll down the window at the intersection to ask a question or make a comment. The flagship 2014 Lexus LX570 regularly forms a mob of cell phone armed picture takers posing for selfies with the Starfire Pearl 6,000lb, 6’3” rock star. The truth is, Lexus builds a beautiful full size SUV. 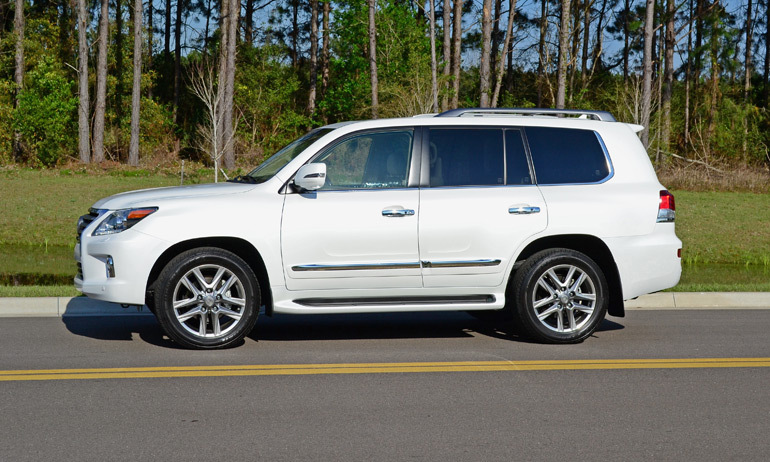 Powered by the formidable 383 horsepower, 404 lb-ft of torque 5.7L 32-valve DOHC V8, the 2014 Lexus LX570 has beauty and brawn, enough to catapult the full time 4WD LX from 0-60 in 7.3 seconds. If you need a frame of reference, visualize a hungry charging polar bear. This analogy actually presents a great opportunity to note that the LX570 gets 14 combined mpgs, 12 city and 17 highway. Using Toyota’s time-tested durable Land Cruiser as a foundation, Lexus developed the LX in the mid 1990’s as a prestige three-row luxury vehicle with no-compromise driving capability. Now in its third generation, the LX570 represents the ultimate combination of off-road utility, towing capacity (7000lbs), styling, and luxury. 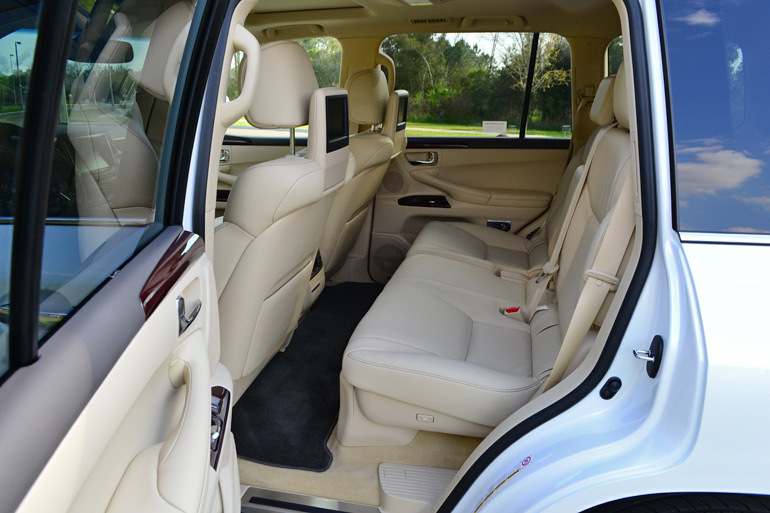 The opulent interior of the LX570 is cavernous and well appointed. Every surface is soft-touch, many composed of contrast stitched semi-aniline leather. 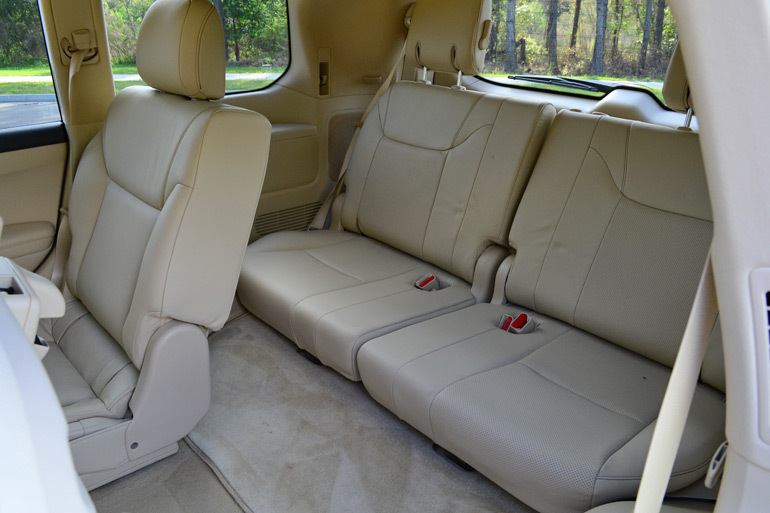 All eight passengers have plenty of room to spread out, and even when all seats are occupied, there is 15.5 cu. ft. of cargo space. 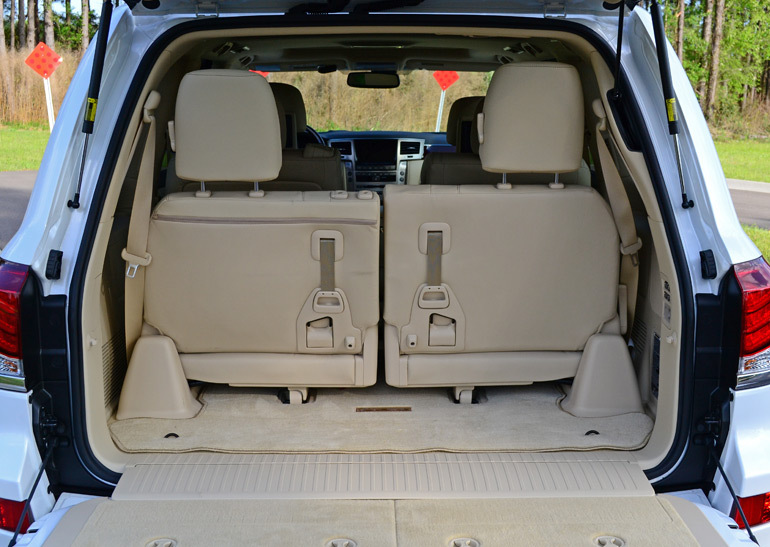 Stowing the power-retractable rear seats expands cargo space to 41 cu. ft., by folding down the power-sliding middle row, that number reaches 83.1 cu. ft. 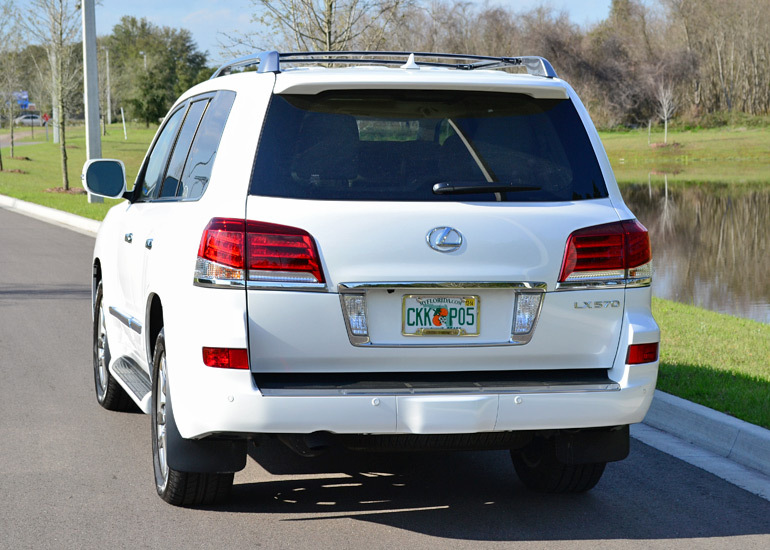 The delicate road manners of the 2014 Lexus LX570 belie the SUV’s off-road capabilities. The adaptive variable suspension continually adjusts the shock absorber’s damping rates, ensuring optimal ride comfort even under continually changing road conditions. When presented with seemingly impossible off-road challenges, the LX570 rises to the occasion by combining the high strength body-on-frame construction, ample power, and the intelligent active traction control based multi-terrain select system. The Lexus literature loosely infers that you can use the LX570 to take your family on a jungle safari while towing a horse trailer. After driving the SUV for a week, the claim actually seems reasonable. The standard nine-speaker Lexus Premium Sound system is powerful and features the iPod/USB connectivity, HD radio, and Bluetooth that you would expect in a manufacturer flagship model, but audiophiles will want to opt for the 19-speaker, 450 watt Mark Levinson Reference Surround Sound audio, arguably one of the nicest sounding multi-media systems available in any vehicle. Driving the LX570 along Hecksher Drive, sunroof open and music blasting, provides the spirit-lifting equivalency of a long weekend spent with loved ones, just out of cell phone range. EPA passenger volume: 83.1 cu.ft.